Completed in 1910, the Herndon Home, was the residence of Alonzo Herndon and his family. Herdon was a former slave raised in a sharecropping family after the Civil War. Herndon studied barbering, and owned and managed a string of barbershops in downtown Atlanta after the Civil War, one of which was considered to be the most elegant in the country with marble floors and chandelier. Investing his income into real estate, Herndon became the largest black property owner in Atlanta by 1900. Later, Herndon founded the Atlanta Life Insurance Company, located in the Sweet Auburn Historic District, and became Atlanta's first black millionaire. The home was primarily designed by Adrienne Herndon, Alonzo's first wife and a teacher at Atlanta University. The couple had one son, Norris. Adrienne died of Addison's disease just three months after the home was completed. 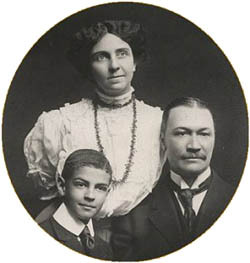 In 1912 Alonzo married Jessie Gillespie. The Herndon home is a two-story, 15-room Beaux Arts mansion built by local black craftsmen. The formally composed building is constructed with multi-colored brick, and features a two-story entry portico supported by Corinthian columns. One-story porches to each side of the building echo this theme in brick piers and wooden capitals. An elliptical fanlight over the main entrance and the balustrade above the full entablature of the building's cornice add a distinctly Georgian Revival flavor to this imposing residence. The Herndon Home is a lasting tribute to the hard work and talent of extraordinary African Americans in Atlanta, and was designated a National Historic Landmark in 2000. After Alonzo's death in 1927, Norris assumed the presidency of Atlanta Life Insurance, with Jessie as vice president. During this period the company experienced its greatest growth. Norris lived in the Herndon Home for much of his life, and filled it with many decorative arts from his travels to Europe, as well as keeping his parents original furnishings. Shortly after Jessie died in 1947, Norris established the Alonzo F. and Norris B. Herndon foundation, a charitable trust which operates the home today as a museum recounting this family's phenomenal rise from slavery to leadership of the nation's black business community. 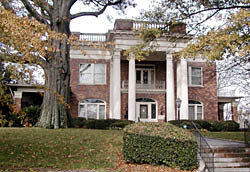 The Herndon Home is located at 587 University Pl., NW, in Atlanta. Guided tours are conducted hourly from 10:00am to 4:00pm. Tuesdays and Thursdays and by appointment only on Saturdays. There is a fee for admission. Call 404-581-9813 or visit the Herndon Home website for further information.